Feb 8, 2015, Harrisburg, PA. If the vote were taken for the Democratic presidential candidate at the Harrisburg Hilton on Saturday, Feb. 7, Senator Bernie Sanders, Independent of Vermont, would likely have won by a landslide. That was the spirit in the hotel ballroom as Sanders addressed the 800 people gathered for the PA Progressive Summit. The annual meeting, sponsored by Keystone Progress, brought together progressive activists—community and trade union organizers, women’s right and civil rights groups, hopeful candidates and door knockers—all of whom made up the democratic wing of the Democratic Party, from all across the Keystone State. “I’m going to try something a little different this morning,” said Sanders to start things rolling, “I’m going to tell you the truth.” He got a wave of laughter and cheers from people who often got something else from politicians. The Koch Brothers, with 85 billion in wealth, were taken as the case in point. Sanders explained that they alone intended to spend over 900 million dollars on the 2016 election—more than the combined total of Obama and Romney in 2012. This meant these “counter-revolutionaries with a far right agenda” would wield more power than both political parties in the recent past. Turning to the economy, Sanders said while the economy was clearly in better shape than when Obama, first took office, it was still clearly in bad shape. He explained the different meanings of official unemployment figures, with 5.8 percent being the most common number cited, but double that, near 12%, was more accurate. For those worried about deficits, Sanders noted that they had been reduced under Obama. But he also insisted that if they were truly concerned about deficits, they would have stood up against the Iraq war. This remark got wild cheers and everyone out of their seats. “The inequality is the greatest moral issue, the greatest economic issue, the greatest political issue of our time,” said Sanders forcefully, driving this point home. It brought the room to its feet in a standing ovation. Why an economic issue? “My Republican colleagues,” Sanders stated, “like to go on about how the wealthy are ‘job creators.’ Well they are dead wrong. You are the job creators, the working families of American are the job creators.’ Why? Because increased consumer demand, rooted in families having more income to spend of things they need to survive and live a decent life, he explained, are what compels businesses to hire more workers—and when the income of hundred of millions of workers shrinks, the jobs will too. But back to the Koch’s. “In 1980, David Koch ran for Vice-President on the Libertarian Party and got only one percent of the vote on the platform that was “kind of kooky, kind of fringy, kind of crazy. And the frightening thing now is what was considered crazy back then is now the main stream of the GOP”. In order to defeat the GOP agenda, Sanders ended his speech with a brief summary of a progressive agenda, noting that point by point, a majority of Americans were in agreement, even if they were voting in conflicted ways. 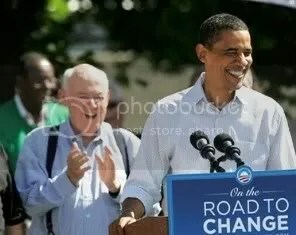 His cornerstone was his own new bill calling for $1 Trillion for investment in new infrastructure and to replace crumbling infrastructure. There were 13 million new well-paying jobs to be created in building bridges, highways, ports, high speed rail and renewable energy. “We also have to raise minimum wage to a living wage,” he declared, along with insisting on pay equity, opposing unfair trade deals, making college affordable if not free, break up the ‘huge institutions’ on Wall St , and last but not least, a single payer health care system that covered everyone. The key organizers for Sanders appearance in Harrisburg were the Progressive Democrats of America, especially its 12 CD chapter in Western PA. They organized a morning fundraising breakfast where Sanders also spoke, attended by more than 150 people and raising over $10,000 on the spot. 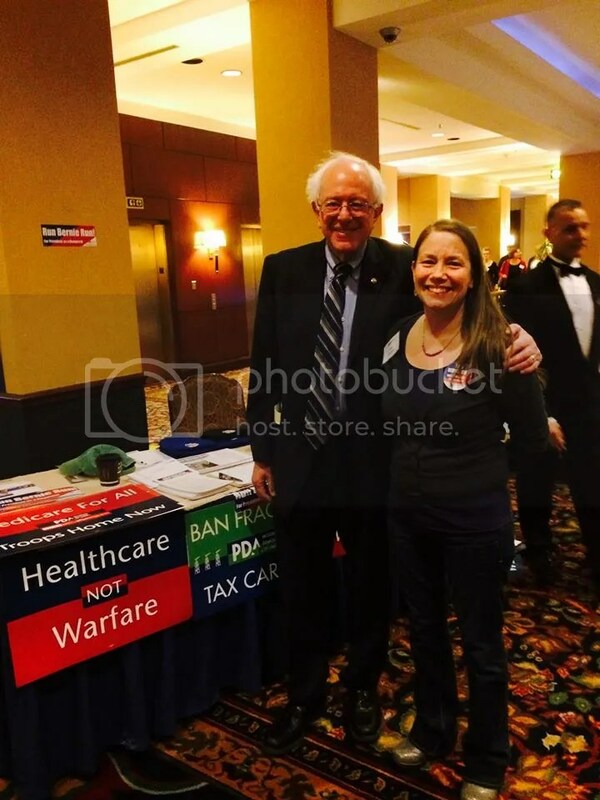 PDA also ran a table, with a dozen volunteers, that set as its aim recruiting people from all across the state to sign up to form Sanders campaign committees in their areas, and they were quite successful in doing so. 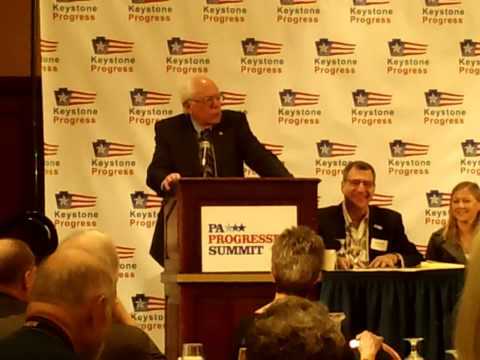 When the local PDA decided to set up a table at the summit for Bernie Sanders, little did we know that Bernie Sanders was to be the Keynote speaker. Our table become a focal point for all attending. A fundraiser breakfast with Bernie drew triple what was expected. There was standing room only. The excitement was overwhelming. This guy is a HIT. He was smothered with fans the whole time he was there. That had to have a heavy influence on him. Pictures with Bernie was taken constantly and he welcomed all as a friend. He is quite a guy. I only wish he was 10 years younger!